As the sun sets over the cascading mountains, a man steps out of his car and walks to the side of the road. Swinging the large metal gate toward his idling car, he then walks to the other side and does the same. After placing the padlock on to secure the gate, he looks back as the last rays of sun fade behind a sea of blooming trees. Unlocking the same gate he’s now locked. Turning the building’s lights on to illuminate the church in the pre-dawn darkness. Cleaning up a baby’s extra mess, while the little one settles down in the arms of a nursery volunteer. Running up and onto the catwalk to fix disconnected wires much to the relief of the audio-visual team. Resetting the platform between services with six-sigma-like efficiency alongside the stage crew. Ensuring a classroom’s setup meets the teacher’s special request. Helping put a spare tire on a car after a single mom (kids-in-hand) walked out of worship to see a flat. Walking down every hall and into every room to ensure all doors are locked or unlocked as prescribed by church staff. Making the long walk from his car parked at the far end of the lot. A majority of those worshipping this Sunday are—through no fault of their own—unaware of this man and the countless faithful servants like him. The men, women, and students who are leading and serving in obscurity. The nursery and children’s ministry workers. Student ministry group leaders. The audio-visual team. Facilities workers. Preparers of meals for those grieving. These are but a limited few of the out-of-the-spotlight, behind-the-scenes volunteers. But don’t let their obscurity obscure their importance. Leading and serving in obscurity is vitally important to ministry. Chuck Swindoll writes in his book Great Days with the Great Lives: “If you don’t learn to live peacefully with obscurity, you will repeat that course until you do. 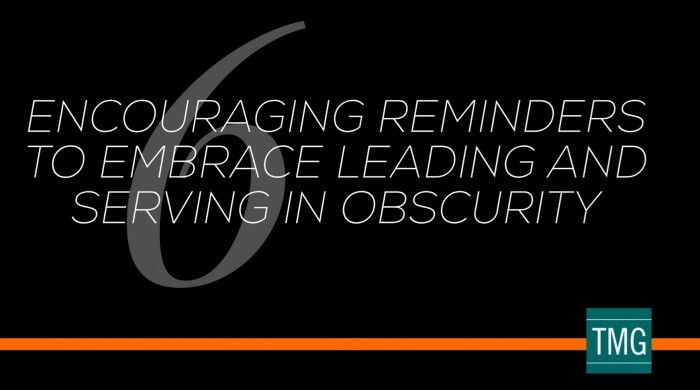 You cannot skip this one and still graduate.” Together, let’s focus on six reminders to embrace leading and serving in obscurity. 1. Leading and serving in obscurity will be a period of preparation. Some who are leading and serving in obscurity desire to serve in more prominent roles; this is not necessarily sinful. Ambition and desire—coupled with a biblical foundation—are actually good, because they indicate a desire to grow. However, we all can’t be a worship leader or Bible teacher on Sunday morning. Some individuals might be on a trajectory towards a more upfront role. In those cases, their current ministry serves as an opportunity to prepare and grow spiritually for a new ministry opportunity. Jesus tells His disciples (including His followers today): “If you are faithful in little things, you will be faithful in large ones. But if you are dishonest in little things, you won’t be honest with greater responsibilities” (Luke 16:10). For everyone, leading and serving in obscurity is a test of faith, regardless of ambition, as we are all called to become more like Jesus Christ. 2. Leading and serving in obscurity underscores the needed protection of prayer. Any and all ministries must be enveloped in prayer to be effective. A ministry’s prominence—or lack thereof—in no way affects its need of prayer. The Apostle Paul writes, “Don’t worry about anything; instead, pray about everything. Tell God what you need, and thank him for all he has done” (Php. 4:6). Everything includes leading and serving in obscurity! God will give you the necessary attitude, energy, and resources to fulfill His purpose for your ministry–even on the bad days when you worry and fear. Do you desire to serve in another area that may be more prominent? Pray about it. God prayerfully speaks to us as we listen to Him. Let Him be your Guide and Protector. 3. Leading and serving in obscurity will present God’s peace. What’s the result of praying? The Apostle Paul continues from the aforementioned verse, “Then you will experience God’s peace, which exceeds anything we can understand. His peace will guard your hearts and minds as you live in Christ Jesus” (Php. 4:7). Prayer brings peace from your worries and restlessness. Leading and serving in obscurity can bring peace to a servant’s heart. 4. Leading and serving in obscurity will produce a purpose. Being chased by the most prominent man in Israel and his army led David to a place of obscurity—a cave. In this cave David lyricizes, “I cry out to God Most High, to God who will fulfill his purpose for me” (Psalm 57:2). The sovereign God whom we serve will use leading and serving in obscurity to meet His loving desires for us. Just as David fled from physical attacks, we also flee from spiritual attacks. The enemy wants nothing more than for us to think ministries don’t matter if they aren’t recognized by others, or that God is not using our ministry in obscurity for our good. When the sight of our ministry is obscured, reach up to the cleansing words of the prophet Isaiah: “‛My thoughts are nothing like your thoughts,’ says the Lord. ‛And my ways are far beyond anything you could imagine. For just as the heavens are higher than the earth, so my ways are higher than your ways and my thoughts higher than your thoughts’” (Is. 55:8−9). Trust God to fulfill His purpose for your life. He won’t let you down. 5. Leading and serving in obscurity will provide for people. Following Jesus frees us from the slavery of sin. Freedom provides choices. The Apostle Paul urges us to “use your freedom to serve one another in love” (Gal. 5:13). Some ministries explicitly touch individuals. For example, a teacher communicates with students, and a nursery worker cares for a baby. Other ministries—often those in obscurity—do not explicitly touch individuals, but do so implicitly or indirectly. If the parking gate isn’t unlocked and the lights don’t work, it’s much more difficult for more prominent ministries to occur. Therefore, the facility team member’s ministry indeed impacts people. The end of all ministries is to serve people with a loving attitude to glorify our God who first loved us. 6. Leading and serving in obscurity will prove God’s promise. Many of the above examples relate to traditional, Sunday-morning ministries; however, it’s very important to remember that all followers of Jesus are called to serve and minister each and every day. The majority of ministry—regardless of prominence—occurs Monday through Saturday. The Apostle Paul likens the body of Christ to the human body in 1 Corinthians 12 and concludes in verse 26, “If one part suffers, all the parts suffer with it, and if one part is honored, all the parts are glad.” Some parts of our human bodies are more prominent than others; however, all the parts of our body unseen by the human eye are essential to life. We can conclude the same about our ministries! If you currently serve outside the limelight, I hope you are encouraged. If you know someone whose service often receives little fanfare, I hope you’ll make the extra effort to express your love for them.